You have decided on a beach destination wedding. Congratulations! You need to pick an appropriate beach Wedding Dress that will look great and will not cause discomfort. Beach Wedding Dresses are best in light fabrics, such as cotton, chiffon or silk with exquisite decorative trim. Typically, for a beach wedding choose traditional white bridal gown, but you can also look good in other options – from soft pastel tones to something completely crazy, bright, tropical. 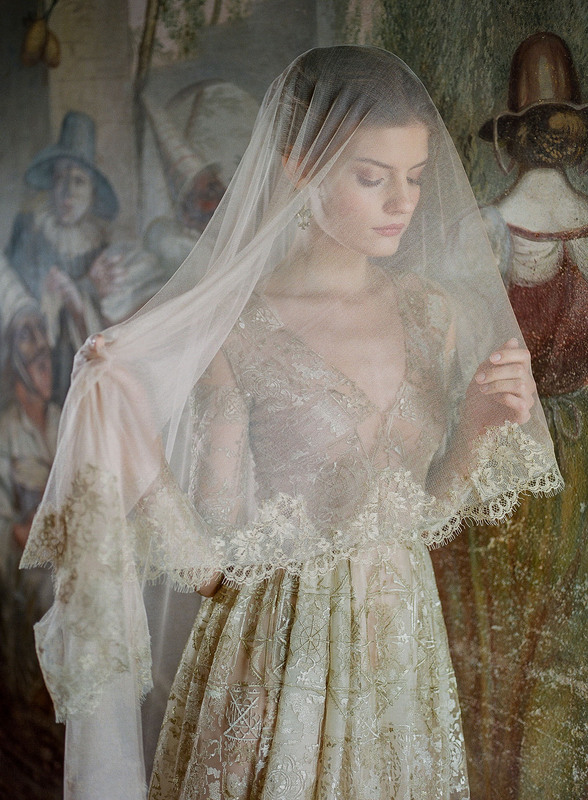 We were inspired charming Wedding Dresses with long sleeves. Long-sleeve gowns can be breathtaking, elegant and totally modern. This type can be rustic or royal, all depends from yours preferences. Lace long sleeves, embroidered bodice and back cutouts do this gowns gorgeous and romantic. Long sleeved Wedding Dresses are chic and gorgeous! Until recently, wearing a non-white Wedding Dress was just for the very audacious bride. Anything other than a white or ivory Wedding Dress used to be considered nontraditional, but not these days. 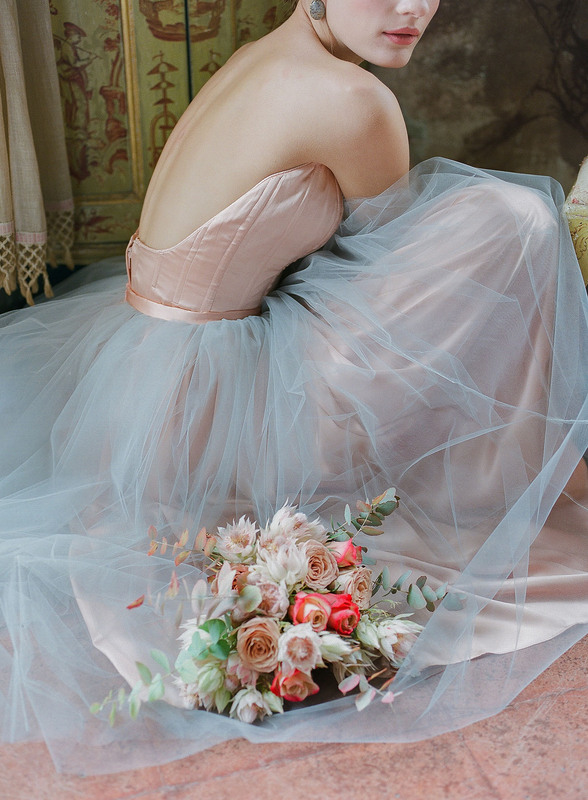 “Blush” has made its official debut as one of the most popular wedding colors of the last few years. If you are a bride aiming for a timeless look with a classy, yet unexpected touch, the trendy blushing bridal gown is the perfect choice. Nowadays brides are opting to add a touch of color to the most important dress they’ll ever wear. 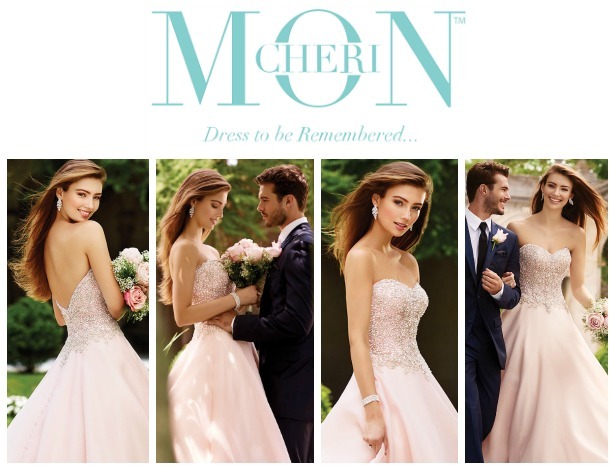 According to our friends at Mon Cheri Bridals, when deciding how to add a touch of color, soft pink tones are at the top of the list. And here are some of the prettiest blushing bridal gowns by wedding dress powerhouse Mon Cheri Bridals. 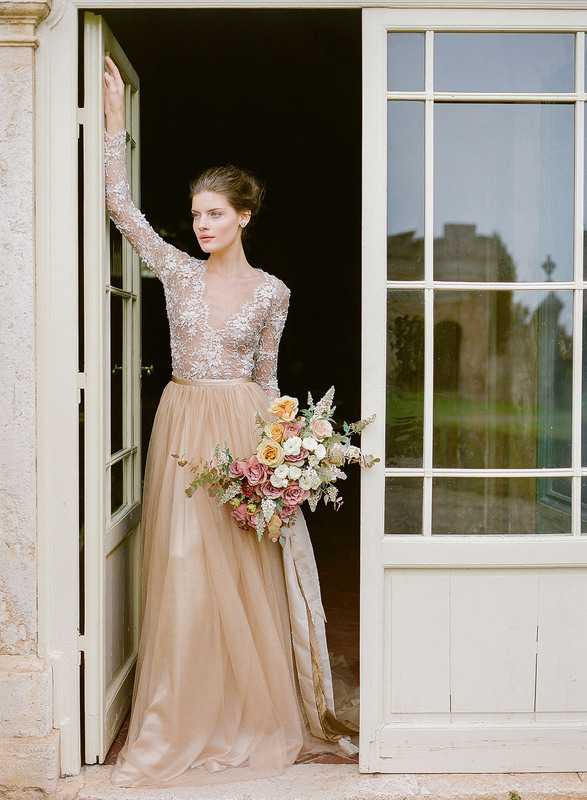 Come with us in this romantic fashion story by scrolling down to see every gorgeous piece! Shades of pale pink never look so pretty thanks to the Spring 2017 Bridal Collection by David Tutera for Mon Cheri. Take for example Adelina, Sonal, Tala and Orabelle: four Wedding Dresses that whisper enchantment and celebrate romance. Brides everywhere are turning to colorful Wedding Dresses as an alternative to the typical ivory gown and designer extraordinaire, Sophia Tolli brings us amazing choices in her Spring 2017 Collection. Our favorites? Harriett, Deon, Monte, and Jacqui. For elegant brides, these four numbers are opulent, yet chic. For a touch of whimsy for your bridal look, take a look at the following two pretty numbers from Enchanting by Mon Cheri. Short, flowy and fun… two perfect choices for a second look, a small wedding, an elopement or destination affair. So what are you waiting for? When white just isn’t romantic enough, look to Mon Cheri Bridals for a blush Wedding Dress that will undoubtedly add a fairytale touch to your big day! And, don’t fail to visit our Pinterest page for more gorgeous Blushing Bridal Gowns by Mon Cheri Bridals. David Tutera for Mon Cheri Wedding Dress collection will provide today’s brides an assortment of fashionable designs to choose from, ranging from traditional and classic ball gowns to elegant & modern dresses. David Tutera Wedding Dresses Spring 2017 shows fantastic bridal gowns in a different fashion color palette of ivory, blush, rose, midnight blue and ebony. Classic floral lace embroidery adds a timeless touch while intricate Swarovski crystals provides a flicker of modern glamour. Look at these perfect dresses for every body type and pin the most loved! 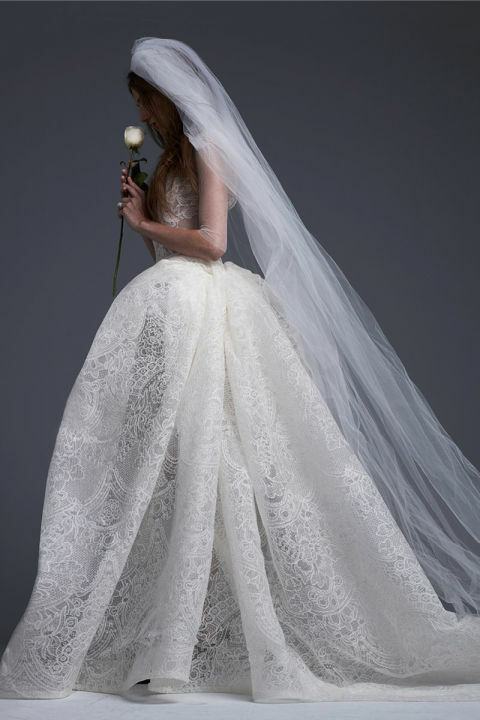 For Fall 2017, bridal guru Vera Wang continued the trend of offering fresh silhouettes and exciting riffs on cuts and techniques her longtime fans and the newly betrothed are sure to swoon for. Her show notes were simple: “Young Love”—and that excitement, innocence and intrigue translated itself into romantic draped sleeves that extend past the fingertips and bare the shoulders, swaths of draped tulle and ball gowns fit for a 21st century Cinderella—minus the saccharin feel one typically associates with brides obsessed with fairy tales. Here, BAZAAR’s exclusive first look at Vera Wang Fall 2017. Light ivory silk faille plunging V-neck gown with draped skirt and sleeves and jeweled belt detail. Soft white silk crepe off the shoulder tailored gown with corset detailing and silk georgette draped sleeves. Soft white silk crepe off the shoulder cowl neck gown with French tulle draped sleeves. Light ivory hand draped French tulle A-line off the shoulder gown with draped sleeve accents. Simona (left): Light ivory silk chiffon off the shoulder gown with straight neckline, draped sleeves and smocked waist detail accented by crimson hand painted sleeves and front slit. Serafina (right): Light ivory silk chiffon off the shoulder gown with V-neck, draped sleeves and smocked waist detail accented by hand applique silk flowers. Light ivory silk faille strapless A-line gown with fringed silk organza flange technique accented by beaded crystal and pearl buildup and hand-knotted ribbon. Light ivory strapless A-line macramé lace gown with French tulle build up and sleeves. Light ivory halter neck A-line macramé lace gown with sheer French tulle back. Light ivory French tulle halter off the shoulder gown with draped sleeves accented by hand placed Chantilly lace applique and front slit. Light ivory macramé lace ball gown with draped skirt and hand placed macramé lace and bridal button accents. Light ivory silk faille A-line gown with draped skirt accented by crystal embroidery and macrame lace yoke. The 2017 Snow by Annasul Y. bridal collection features exquisitely romantic gowns adorned with delicately feminine embellishments. Executed in a stunning array of laces, this dreamy collection presents timeless silhouettes paired with elegant illusion necklines and backs. Photos courtesy of Snow by Annasul Y. For details, visit Snow by Annasul Y. Photos courtesy of Mikaella Bridal. For more information, visit the Mikaella by Paloma Blanca website. For details, visit Anna Campbell. Deep in the heart of Tuscany is the Villa di Geggiano. Its walls are decorated with hand-painted frescos and gorgeous windows, antique furnishings from the 18th-century fill the rooms. 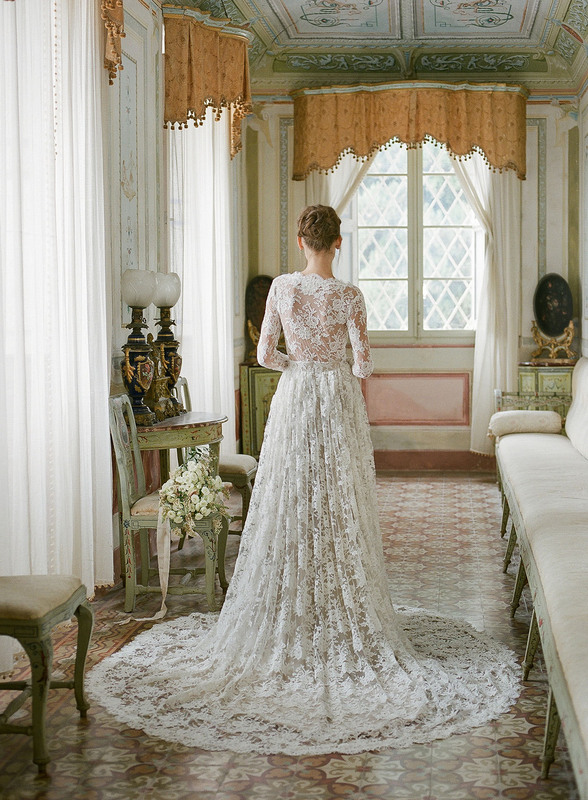 It was this villa that inspired the latest collection from Emily Riggs: Nouveau Renaissance. We’ve got an *exclusive* first look at the photos by Corbin Gurkin!! 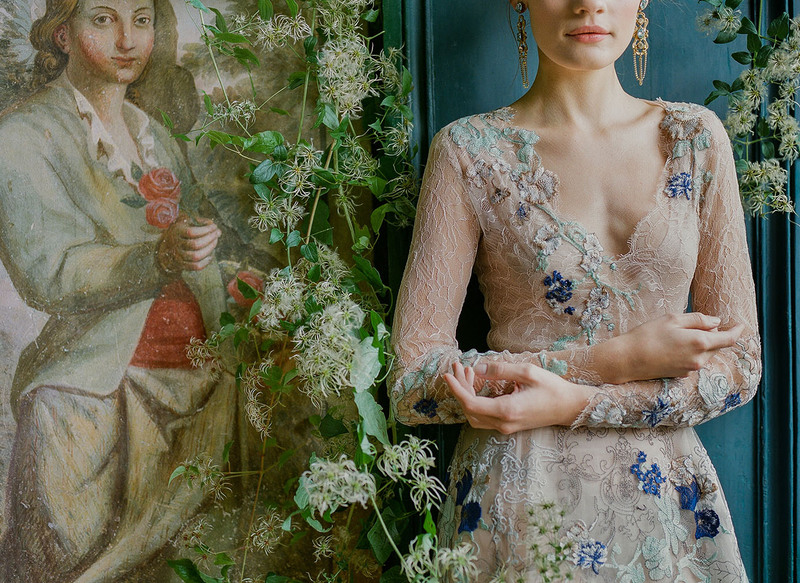 Emily designed intricately detailed dresses using only haute couture fabrics, such as hand beaded French laces and Italian embroidered tulles. 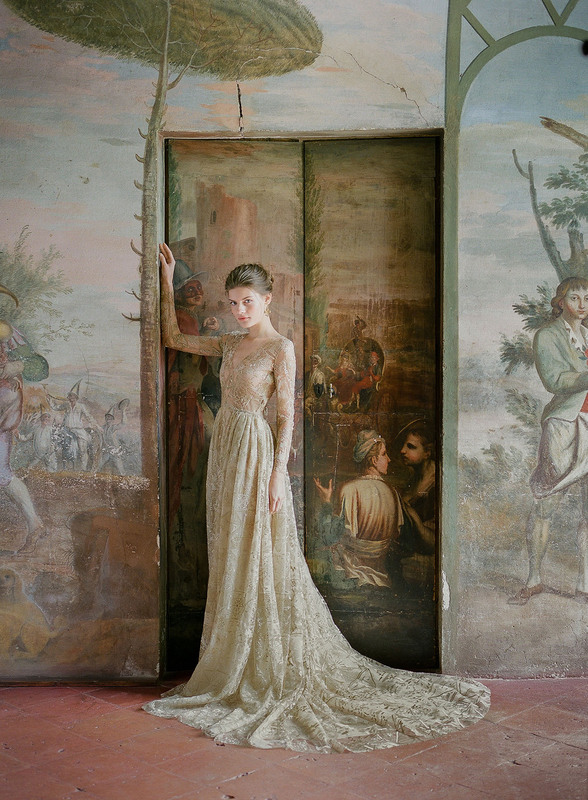 She tells us I made all the gowns to go with the Italian frescos and the overall mood in the villa. The Italian villa is absolutely astonishing and provided the perfect backdrop for these meticulous creations! 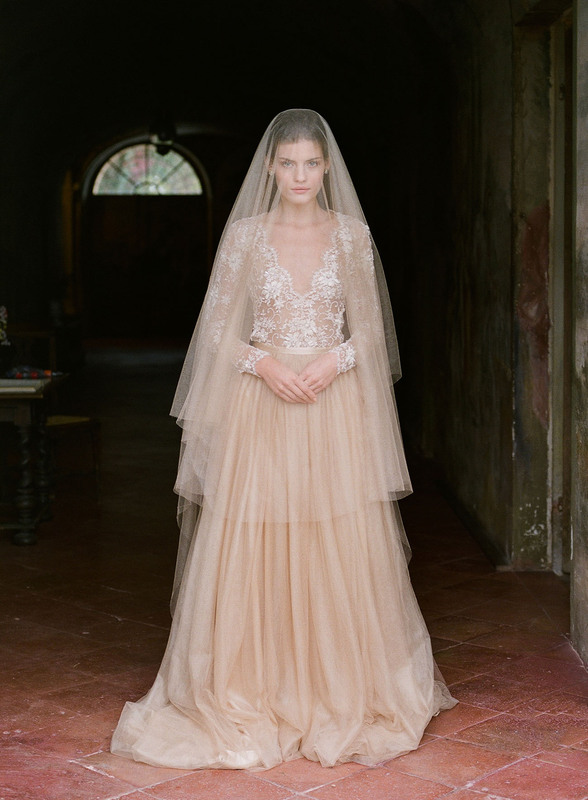 All the gowns + veils were created in Emily’s Portland Oregon atelier and are available for purchase on her website. Made using exquisite hand beaded French Chantilly lace with sequins, beads and layers of silk taffeta organza, silk chiffon georgette and soft ivory tulle… The Carrara is simply exquisite. 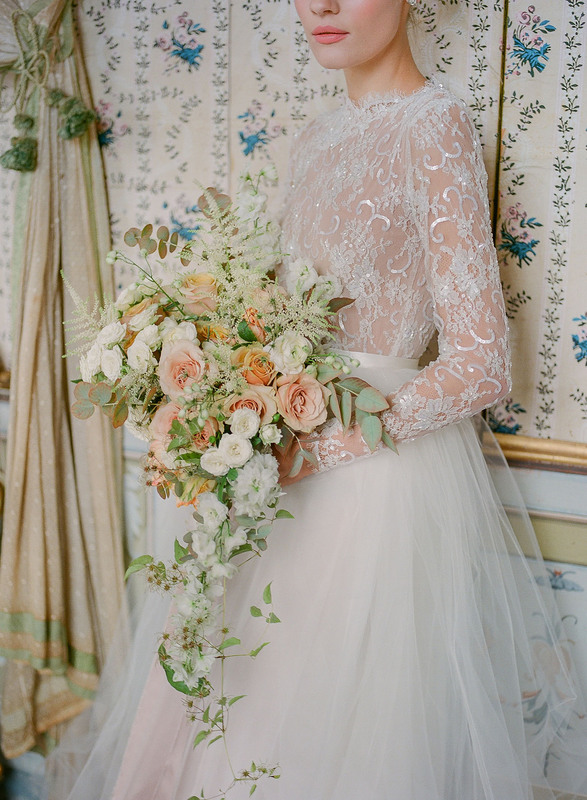 Meet the Verona gown and all of its floral embroidered lace goodness. All the *heart eyes* for this Castellina dress! 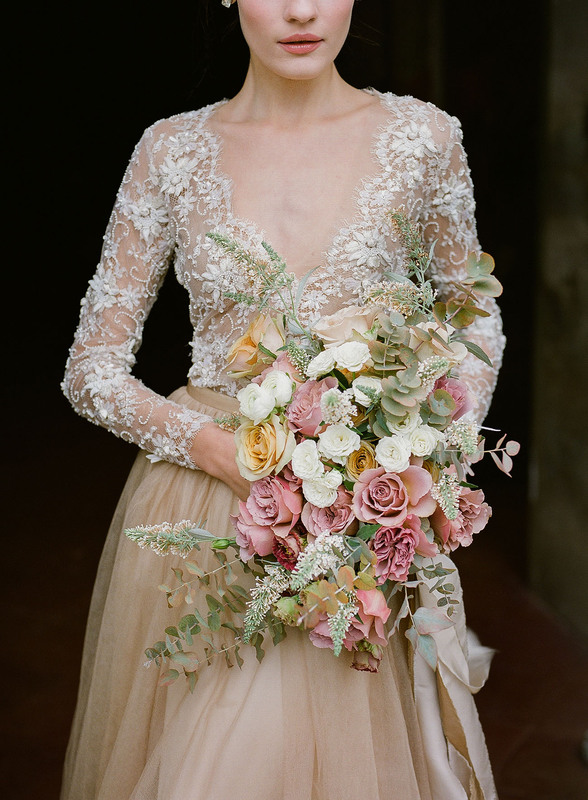 Holy smokes… Those antique roses in the bouquet, complemented by the muted tones of the gown! Federica Beni styled + coordinated the whole lookbook perfect, don’t you think? The Matera gown features gold lace + gold Italian silk taffeta organza. Stunning, exquisite, gorgeous, radiant, beautiful… The Nouveau Renaissance collection is just too good, right?! Which ones were your fave? Let us know in the comments below!